Nine of the 10 least hazardous metro areas have median home prices below the $287,400 national median. Each of the five components is measured on a scale of one to 100, where 100 is the most hazardous metro area for the category and one is the least hazardous. The overall Natural Disaster Hazard Score is an average of the five components’ frequencies. Providence, Rhode Island, with a Natural Disaster Hazard Score of 9 out of 100, is the safest-rated metro area. Providence’s only component score that wasn’t zero was Hurricanes. Washington, D.C. and Los Angeles are the most natural disaster-prone major metro areas, each with a Natural Disaster Hazard Score of 52. Los Angeles has the highest rates of both earthquakes and fire, while Washington, D.C., ranked highly for hurricanes and floods. Las Vegas, one of the safest cities from natural disasters, is also one of the most popular migration destinations, with the sixth-highest net inflow of users searching for homes according to Redfin’s Q1 Migration Report. Nine of the 10 metros with the lowest Natural Disaster Hazard Score ratings have lower home prices than the national median price of $287,400 in February. On the flip side, many of the most disaster-prone metros, including Washington, D.C., Los Angeles and New York are expensive coastal cities that home searchers are increasingly looking to leave. 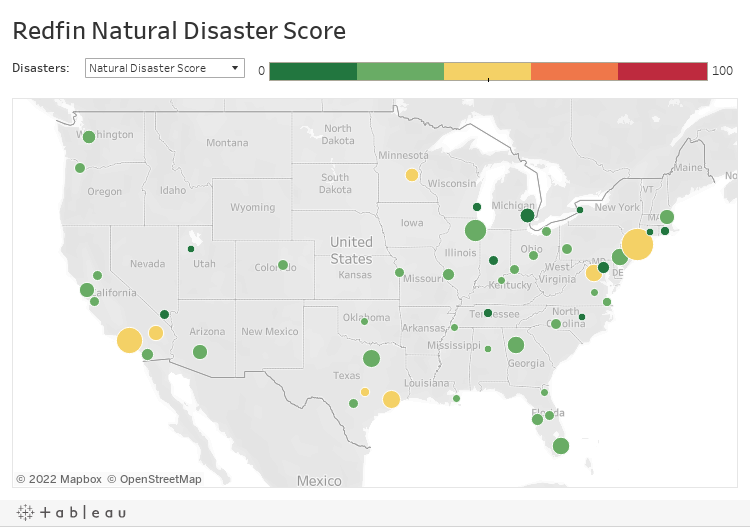 None of the expensive coastal markets have a particularly low Natural Disaster Hazard Score. The high-cost coastal metro area with the lowest score is Boston, with a score of 24—the 17th-lowest score of the 50 biggest metros. San Jose and San Diego—the 18th and 19th-safest metro areas—both have scores of 25. In addition to high home prices and decreasing affordability in cities like Washington, D.C., Los Angeles and New York, the likelihood of natural disasters may be another factor driving homebuyers away from the coasts. When hurricanes, fires, earthquakes and floods are factored into the equation, the affordable inland metros are even more attractive destinations. As you can see in the map below, the metro areas with the highest Natural Disaster Hazard Scores are spread across the country, not centrally located in any one region. The Natural Disasters Hazard Score is made up of five parts: earthquakes, fires, floods, tornadoes, and hurricanes. We used Disaster Declarations Summaries data from FEMA to determine the number of each type of disaster in each metro area between 1953 and the present. For each of the five components of the Natural Disaster Hazard Score, we scale the rates across the top 50 metro areas such that the metro with the largest rate is scaled to 100. For example, the Atlanta metro area had the highest number of tornadoes (8). That is converted to 100, and Kansas City, which had half as many tornadoes (4) is scaled to 50. We also break the 50 metros down by percentiles, then we average the two numbers to arrive at the individual components of the Natural Disaster Hazard Score. The five components are then averaged together to create the overall Natural Disaster Hazard Score.